Summary: A top secret mission needs volunteers. After the bombing of Pearl Harbor in 1941, the United States joined World War II. And soon after that, young pilots were recruited fro a very secret – and very dangerous – raid on Japan. No one in the armed forced had done anything like this raid before, and none of the volunteers expected to escape with their lives. But this was a war unlike any other before, which called for creative thinking as well as bravery. Nathan Hale’s Hazardous Tales are graphic novels that tell the thrilling, shocking, gruesome, and TRUE stories of American history. Read them all – if you dare! About the Author: Nathan Hale is the #1 New York Times bestselling author and illustrator of Nathan Hale’s Hazardous Tales. He also wrote and illustrated the graphic novel One Trick Pony. Hale lives in Provo, Utah. Learn more at hazardoustales.com. 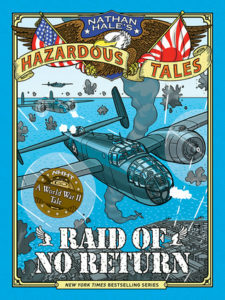 Review: The Hazardous Tales series is the series I use when kids say that nonfiction is boring AND when teachers say that graphic novels aren’t complex because this series, and this book, is complex, interesting, well crafted, funny, and just everything you’d want from any book, much less a nonfiction graphic novel. And I am so happy to have a World War II Tale because so many students ask for it, and this is a new story for me, so I know it’ll be new for my students as well. Also, I think this specific mission will lead to many discussions because the idea of volunteering for a deadly mission is something that so many of my students struggle to understand because it isn’t something that they need to even consider, so to look at these men’s decision-making and willingness to fight for their country. 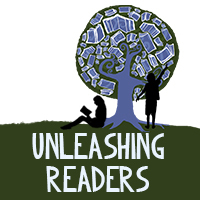 Other Hazardous Tales reviewed in the past here on Unleashing Readers: Alamo All-Stars and The Underground Abductor. Hazardous Tales tip: I recommend starting with the first book, One Dead Spy, then you can read any of the others in any order. Nathan Hale’s Hazardous Tales opens up a world of American stories that are often overlooked. With multiple books focusing on big topics, like the Revolution, Civil War, Alamo and Westward Expansion, Hale is able to give students (and teachers!) an engaging and realistic depiction of the experiences of American heroes and villains. With his humorous and relatable characters, he is able to connect with young readers on an unprecedented level in regards to nonfiction novels. One of my favorite attributes of Hale’s series is the way he inserts side stories filled with background information and informative detail on corresponding events and individuals. He has the ability to make these often dull stories, come alive with his animated and entertaining illustrations. His stories are sure to captivate readers of all ages and interests. Every history teacher in the United States should read this series! Even if you feel you wouldn’t have enough time to teach the entire book, it would be a great visual to provide students when discussing certain topics or figures. 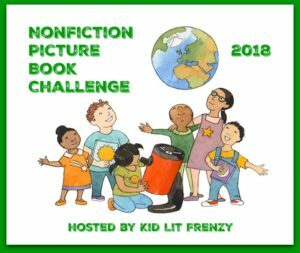 Some excerpts in this series would only take about 5-10 minutes to read aloud and discuss with your students, but would definitely leave a lasting impact! This series has even inspired me to design lessons based around historical texts for young readers and has also ignited my love of history again. Leaving these books to simply sit in my classroom library, would be a huge waste for my curriculum and more importantly, my students. Not only will it give insight into little known stories of America’s major events to enhance instruction, but it will intrigue students to dive deeper into historical texts that they would typically overlook. Why did these soldiers volunteer for a mission they knew nothing about and that they knew was very dangerous? Why do you think the part of World War II in the South Pacific isn’t spoken about as much as the European front? How did the planes have to be changed up to be successful for the mission? Why? Trying reading the book the way it was written then switch it up and read one plane’s story at a time–which way did you enjoy better? How did this mission change the course of the war against Japan? I may not read them all, but I do see why the series will be an important part of a classroom library, Kellee. They seem very good and inspiring for further research, too. Thanks for sharing so much. Many teachers should read your post! I had a 4th grade student who fell in love with this series this past year. Glad there is more!